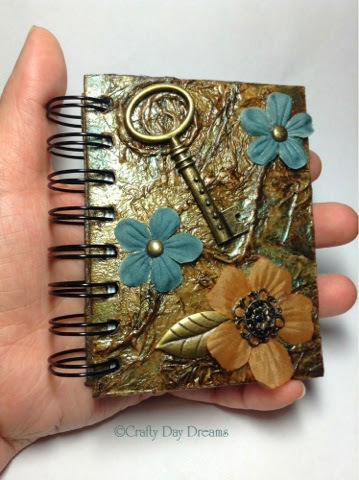 From Trash to Treasure...I found a broken journal at one of my local Michael's and couldn't resist buying it. I had to see what I could do. Looking at it the only thing wrong was that the elastic closure was pulled out from where it should have been tucked into the book. That's a slightly easy fix if things go the way they should. I brought the journal home, repaired the elastic (thankfully everything did go the way it should,) and got to work on painting. I painted and painted and painstakingly painted with the tiniest brush I had. All in all it took me about four to five days of painting on and off. The intricacy and the tiny details made my eyes go buggy. I had to do it in sections and at intervals to give my eyes a break. Looking at the brown and the gold I immediately thought that this book was screaming to be a steampunk book. 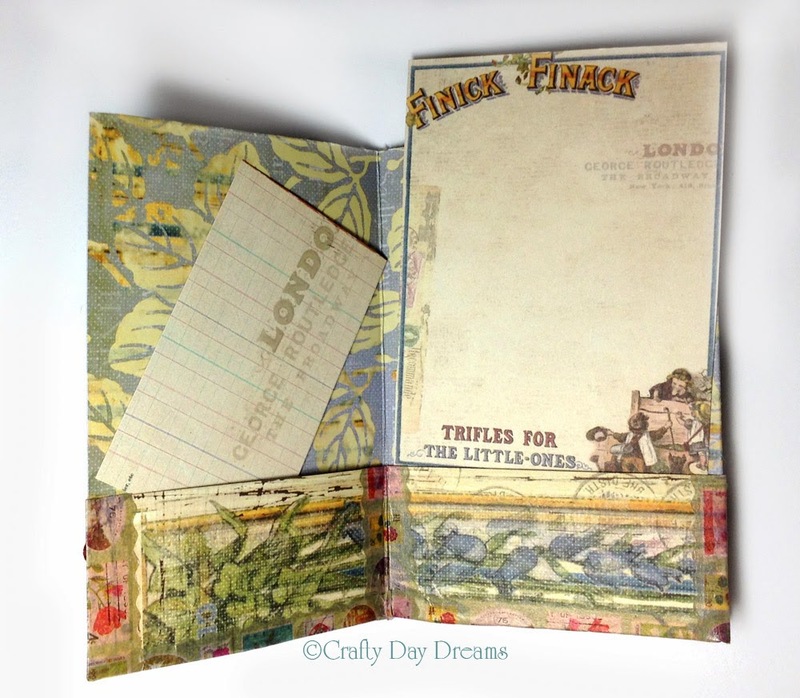 I set off to find a digital steampunk stamp that would be a perfect fit for this book. 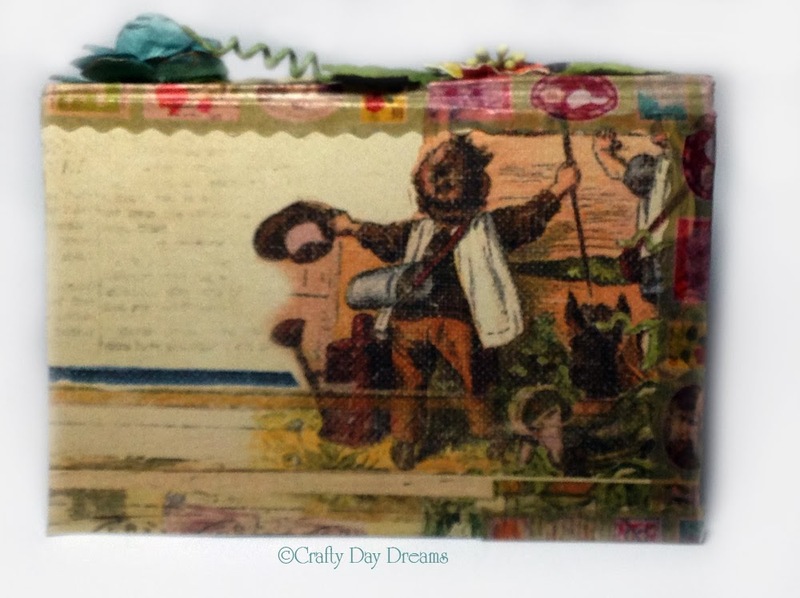 I came across that stamp on StitchyBearStamps by a creator known as BB Kakes. I purchased it, read the TOU to make sure it I was within the right to use it for this project, and printed it out a few time on some Copic marker friendly paper. Why a few times you might, well it's so I can use one test colors and play with, one to lay out my colors, figure out shading and how I'm going to finish it, and the last one to do my final colors on. Here's my second one with my colors listed so I know which markers to use where on the final. And here is the final all colored and fussy cut out. 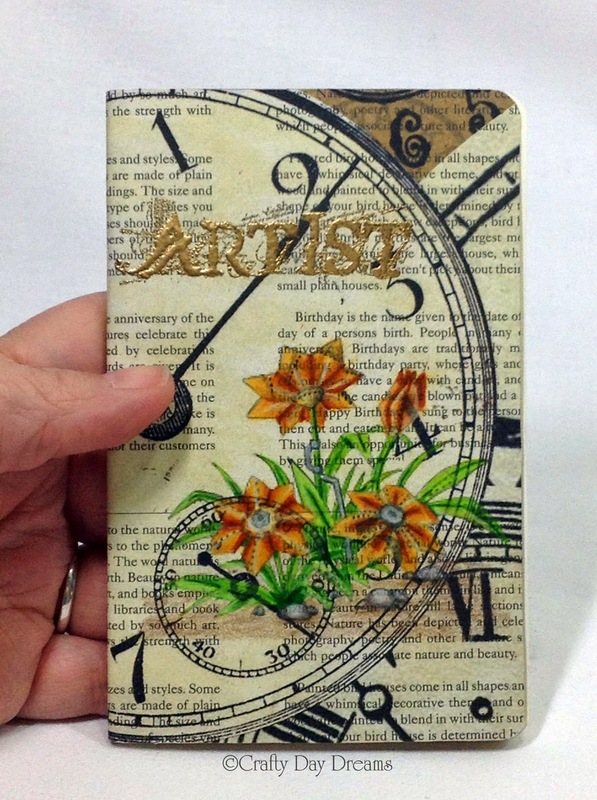 On the final image I used Tim Holtz's Distress Stains and Paints for the gears and metal. I used some Ranger Glossy Accents on the glasses and the face of the pocket watch after shading in the gray color to give them the glass look. 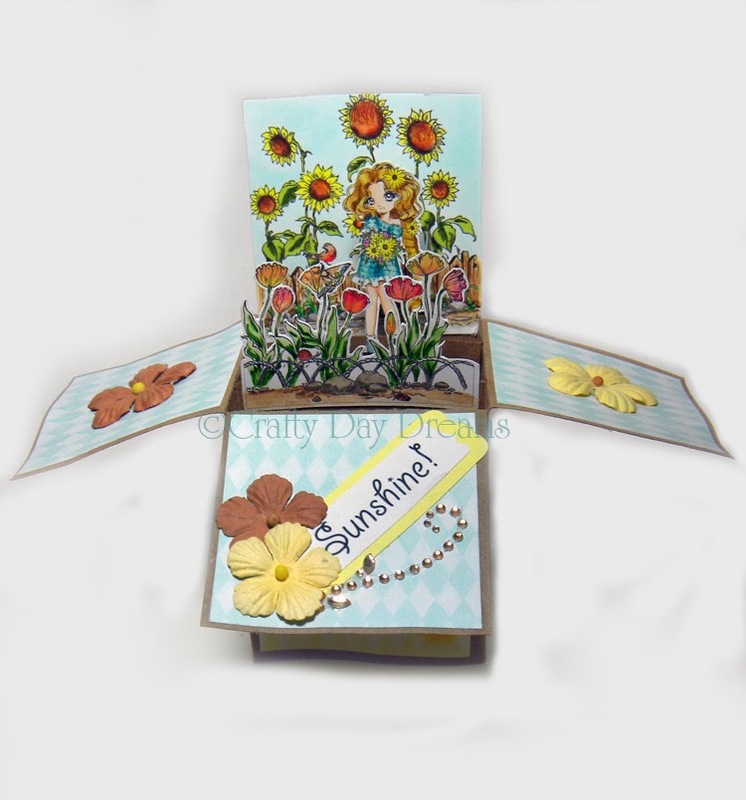 I used some Prima Marketing Engraver Collection "Cesello" (845315) paper as the back ground. Glued my stamp just off center. I placed the "Jouranl" sticker from Prima's Engraver collection (563479) so that the end of the sticker lined up with the edge of her shoulder. 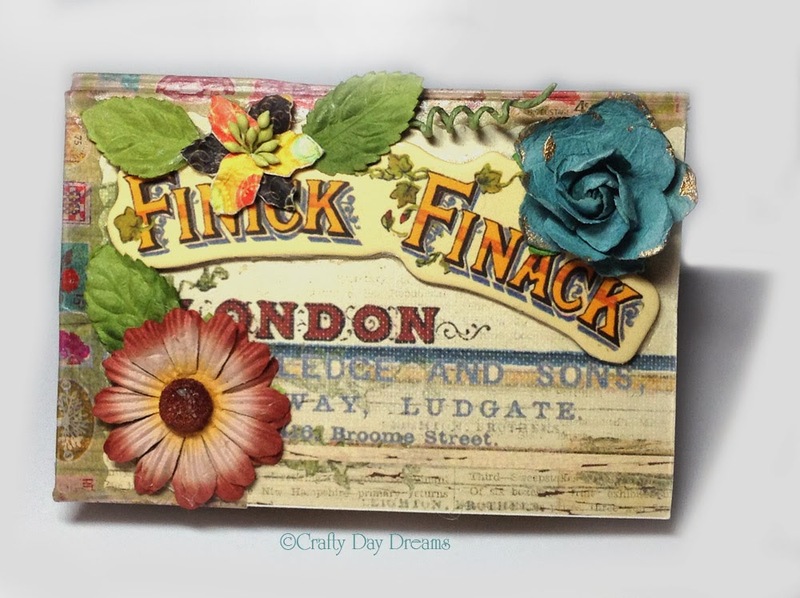 I used some Prima flowers for embellishment (Black rose -552619, Small maroon roses - 553302.) On one of the small roses I pulled out the center of the rose and added a button (550776.) The key paper clip (564681) I cut the clip part off of to make it look like just a key. 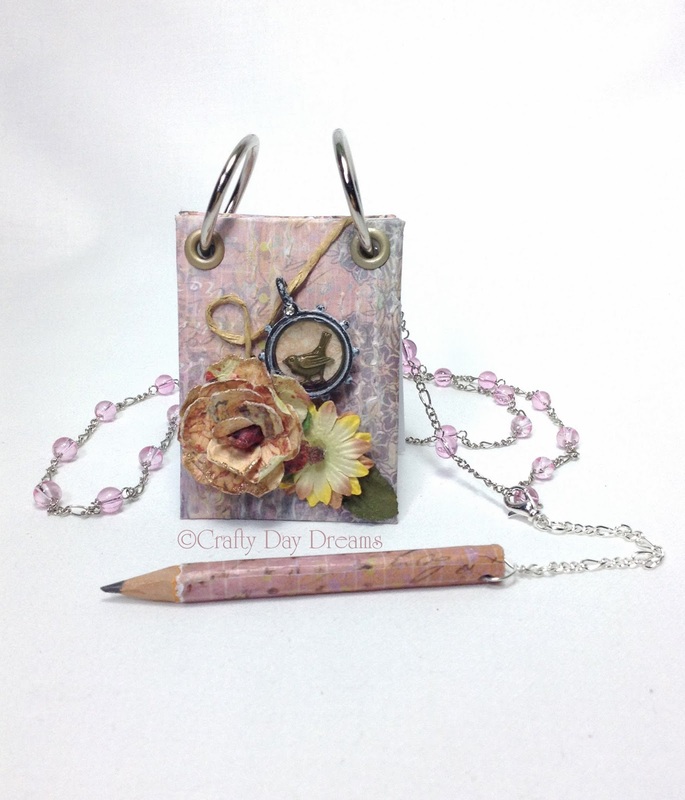 I then added miscellaneous mechanicals, gears from Tim Holtz and Bead Landing along with some clock hands and key hole from Bead Landing. Cutting it close with this one. Last day of the month posting....It's been a crazy month with the kiddos last few days of school just last week. I managed to squeeze in some time to do some coloring for the new Make-it-Crafty's coloring challenge. In case, you missed my posts for a few months you these coloring challenges are a fun way to challenge or work on your coloring skills. So there are two different challenges, a hard and an easy one. This month the hard is coloring curly hair and the easy is coloring with pink and brown. Because I was on such a time crunch this month I opted for the easy one. 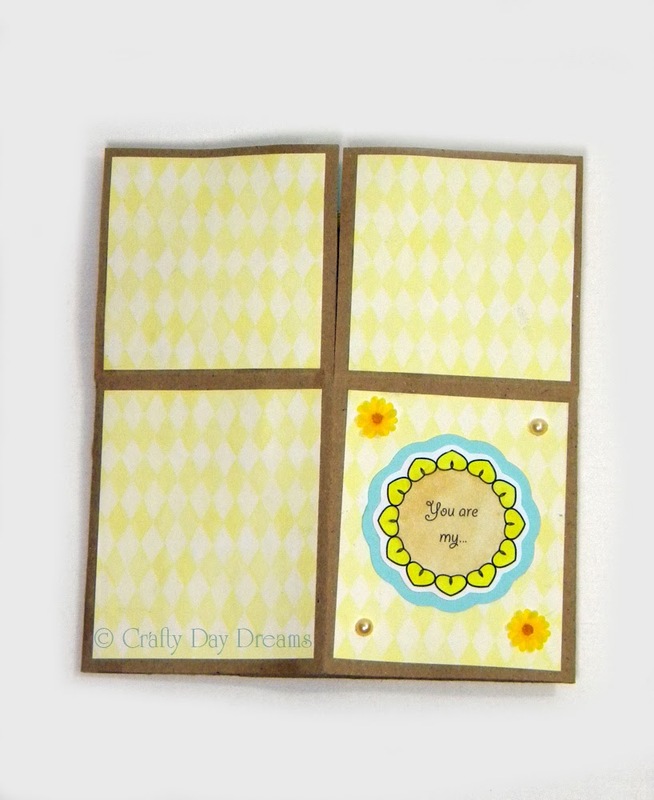 Lets see....I started with two different digital stamps from Make-it-Crafty. I chose these two images because it was also "something girly" (the challenge's title, and the Facebook group challenge.) 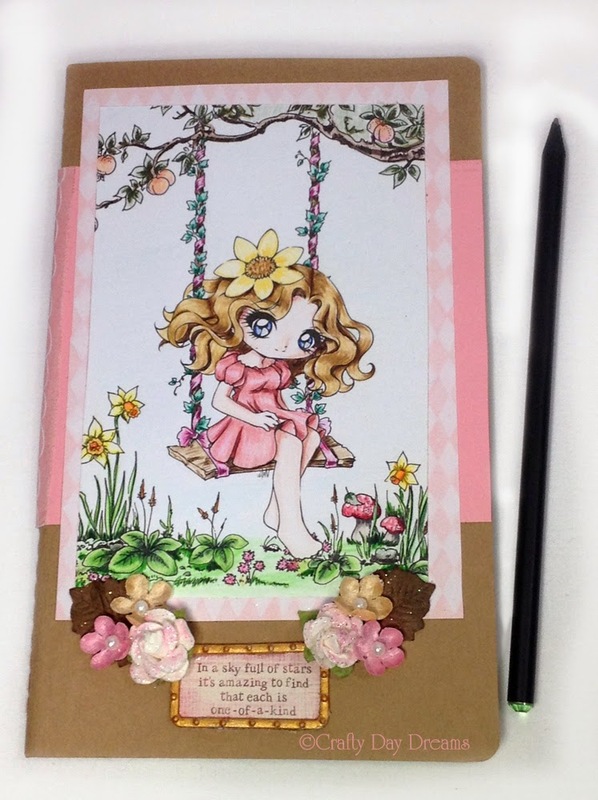 As a little girl I loved to swing, and so do my daughters, so I thought this would be perfect to do as something girly. To make the final image I took the two into Photoshop; flipped Annalise, rotated her a little to line her up with the swing and removed some of the daffodils to come up with my final image. I held off coloring until my new favorite color pencils arrived, Faber-Castell Polychromos pencils. This was the first image I colored with them and I'm in love. They blend beautifully and lay down easily, by far the best pencils I've used. To top it off all of Faber-Castell's lines match so you can use markers, pencils and watercolors with ease. So excited to do more with their products. 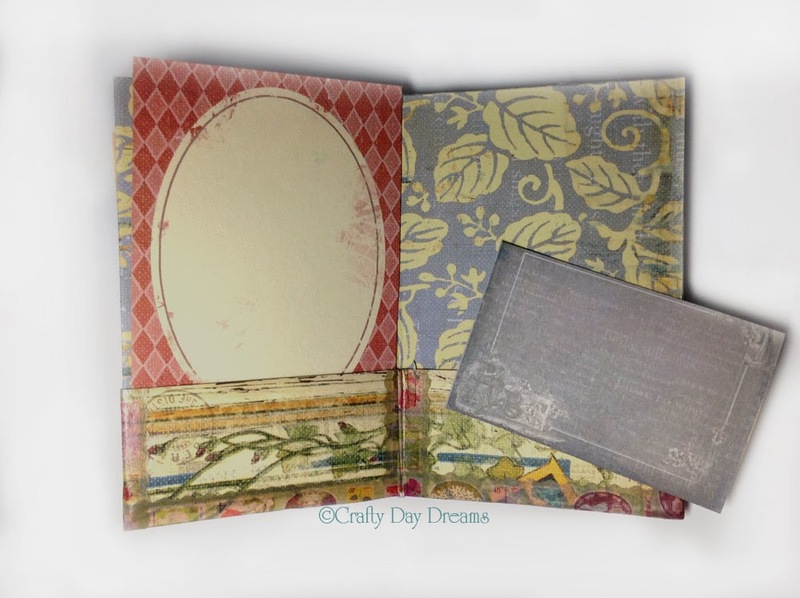 Any who....I used my finial colored image to alter a medium sized Moleskin lined journal. Added some new Prima Marketing Inc. flowers to it. 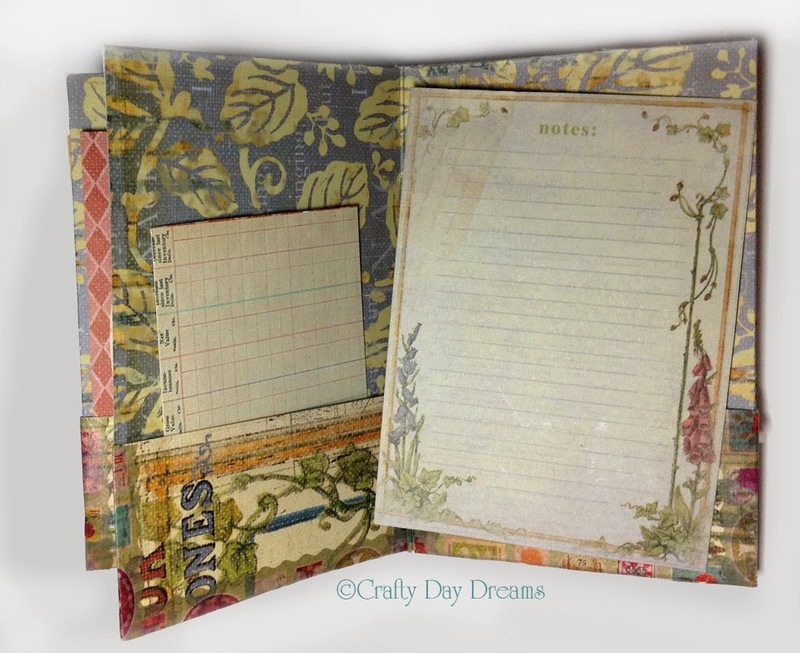 Throw in some papers, Tim Holtz Distress Stickles, glitter, metal frame, Silks paints, leaves and a fun inspiring saying and you get the finished journal. 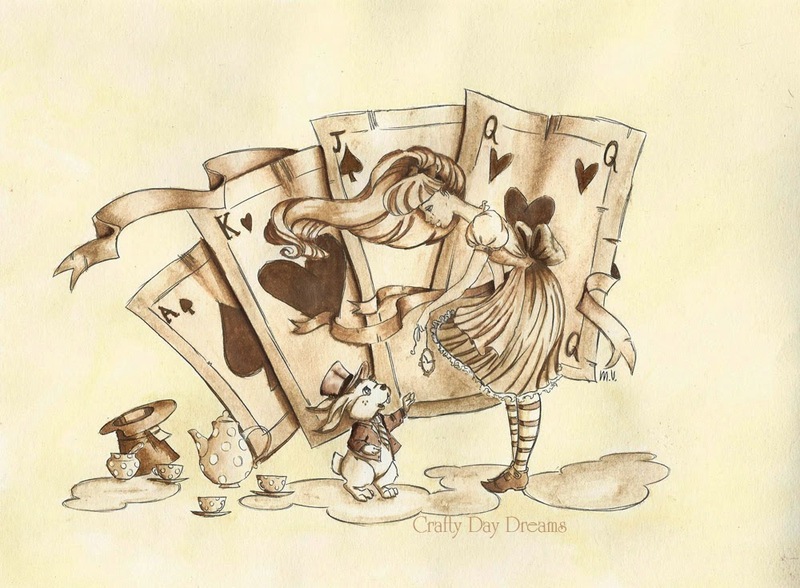 By the way the cute little saying is "In a sky full of stars it's amazing to find that each is one-of-a-kind." 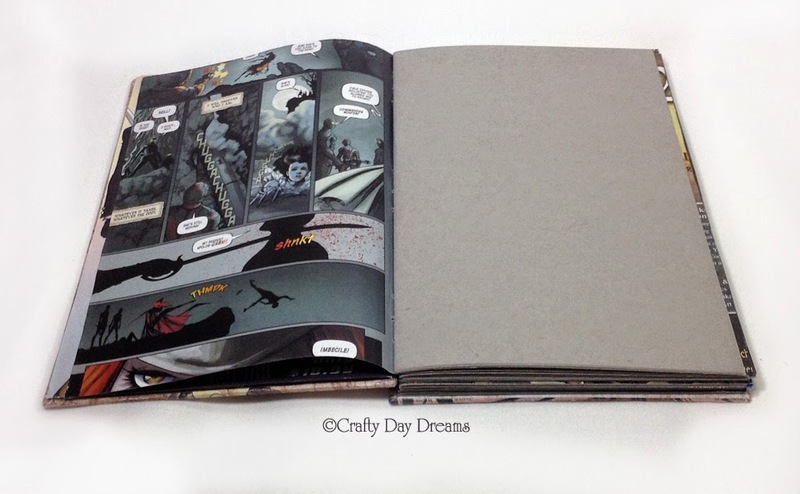 My Comic Book Book.....This book took me a bit of luck to make. When I found out that my husband was going to set up a Hartford Comic Con I decided I was going to make a book for it. 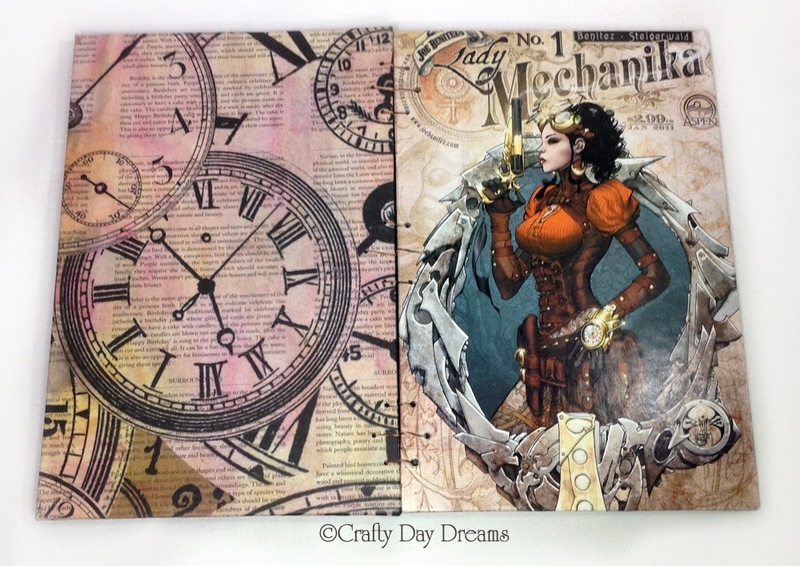 I wanted to make the book from one of my favorite comics out there, Lady Mechanika. I did not want to use one of my many copies of the comic so I had to find a book that was a duplicate to one that I already owned. (Yes, I am one of those people who collects the many different covers.) That was not an easy feat. The book is very hard to come by now, so it took some calling, driving to different shops but I finally found one about an hour from me. The book started out looking just like any other comic book. I was a little worried to take the comic apart and use it, afraid I would mess it up some how, either gluing or cutting it. One mistake would lead to a very frustrated and mad me. Needless to say with all the worry I took my time with it. Over all the book took me just over a week start to finish including the pressing and drying times. The front cover of the book is the front cover of the comic. 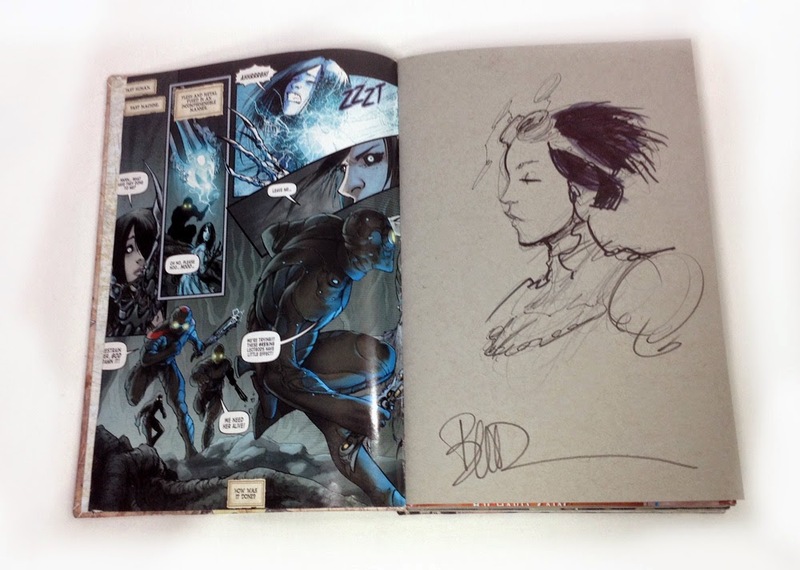 The signatures are surround by the cut interior pages of the comic (I wish I could have kept them full size.) I kept them in order so you can at least read the first pages of the signatures in order. 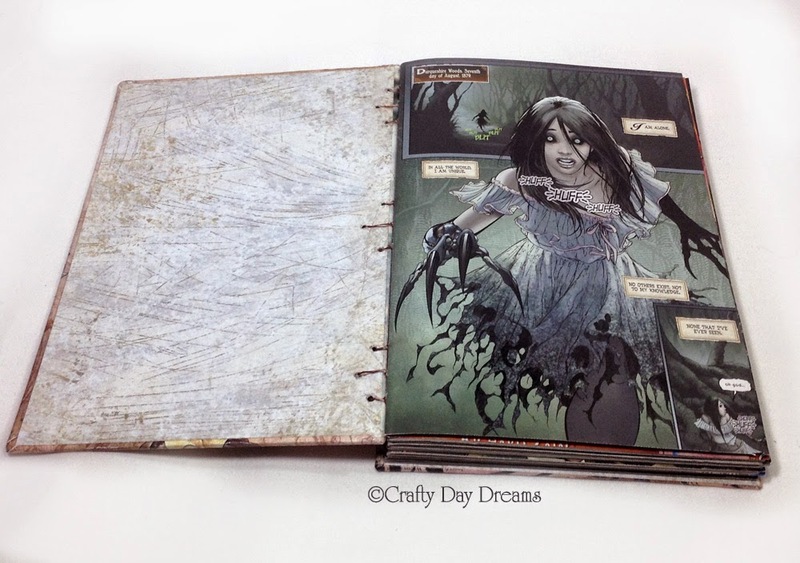 The interior pages are the Toned Gray Strathmore sketch paper. 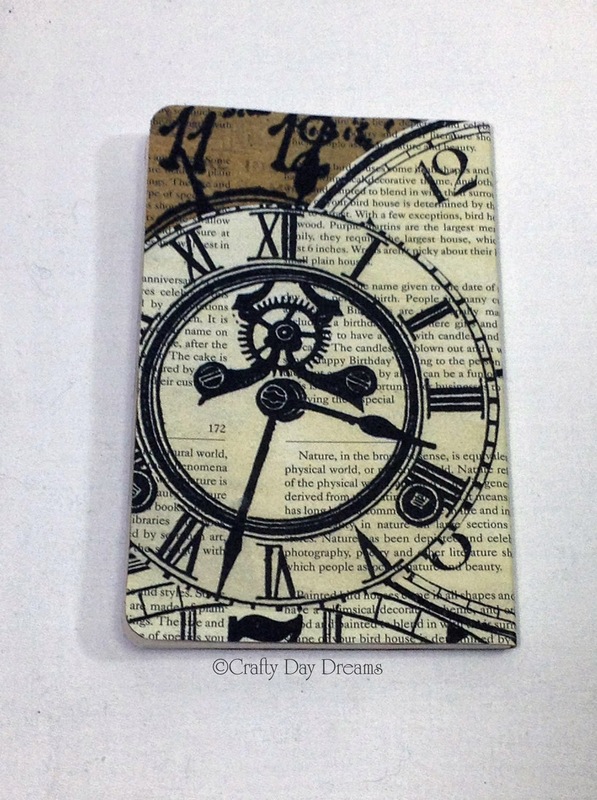 The back cover of the book I took the Recollections Clocks paper and water colored it with some Tim Holtz Distress Stains. I Coptic stitch bound the book with some variegated brown and beige cotton thread that I waxed with local bees wax. 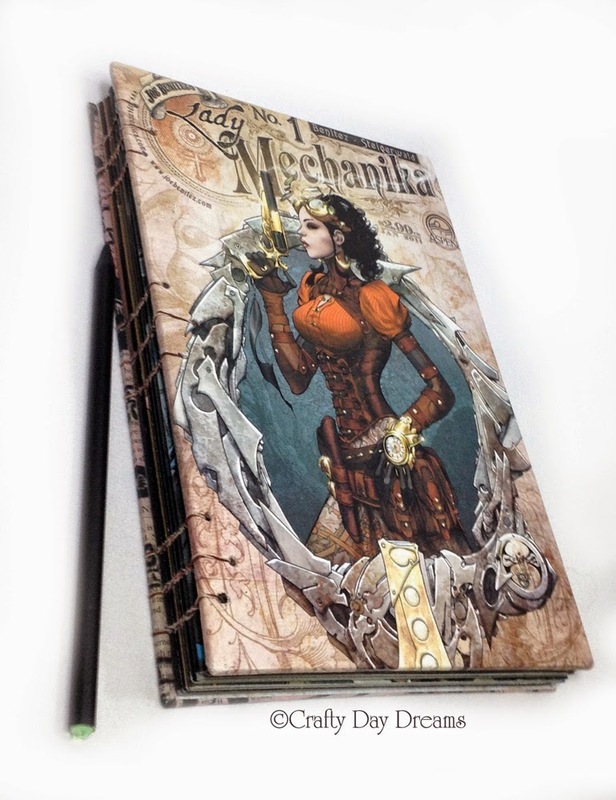 My Lady Mechanika comic book book! So now the book will be traveling with me to shows and cons, when ever I can get to them, to have others do sketches in it as well. I'm thinking a steampunk theme is in order but that was apparent from the start. I have to say right off the bat that this is one product I am seriously disappointed in. I found a couple of the tapes that I liked and had some wonderful ideas for them but now they just sit all sad on my craft table. Those are the two tapes I bought. I had some really great ideas of ways to use them. The back of the package say that the tapes are "repositionable" and "ink-friendly." This is unfortunately not true. 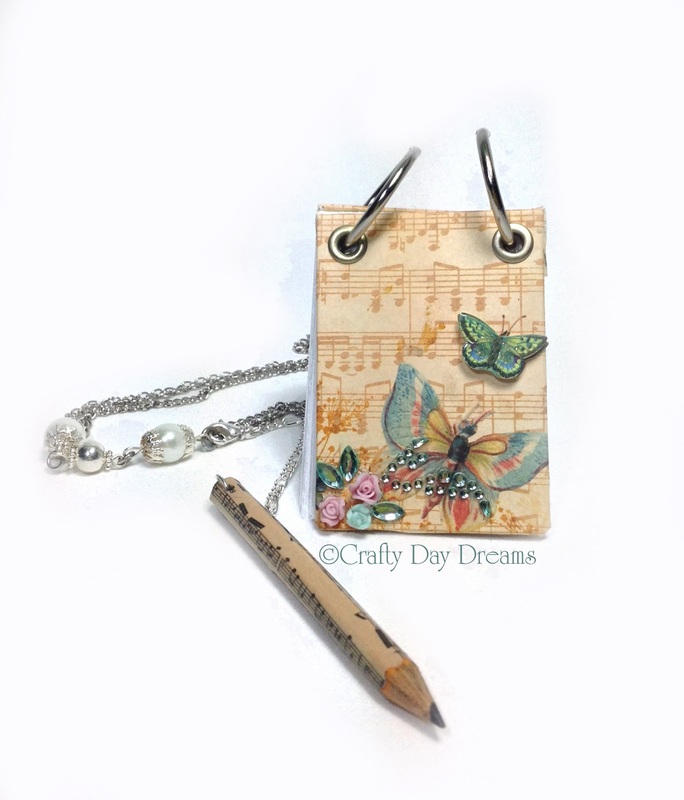 The butterfly one was going to be inked and used on the edges of a book. However this did not go as planed. Below is the corner of the book that I had to scrap because as you can see the tape is not re-positionable. 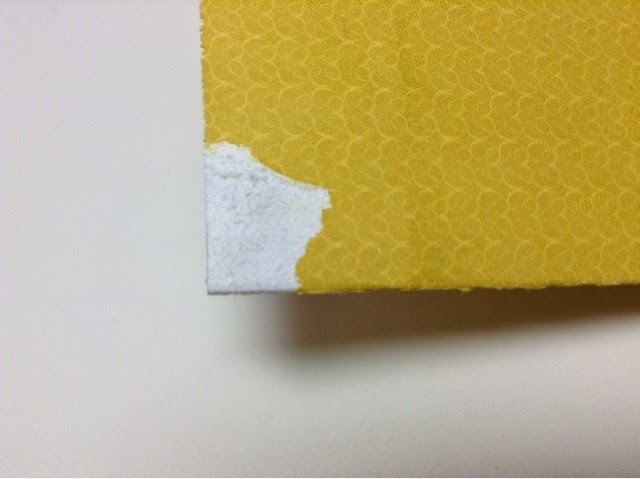 It peeled away a layer of the colored cardstock when I went to go move it. Thinking that maybe it was just the cardstock paper - mind you it was a double sided piece, so it was not a cheap piece of paper to loose out on - I decided to test a different piece of paper. This is just a scrap piece of paper I had laying on my desk. I laid the small piece of tape on it, gave it a gently run over with my finger and then tried to gently peal it off. As you can see that did not succeed with out peeling off some of the paper. So this tape is far from re-positionable. Okay so it's not re-positionable. You say you can live with that as long as you are careful when you place it. Inking it still gives you plenty of options. So lets try inking this tape. 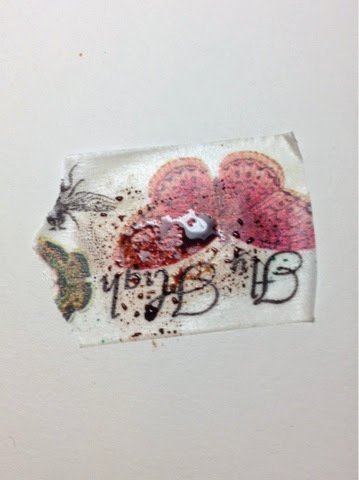 I laid down a small piece of tape on a piece of scrap paper. 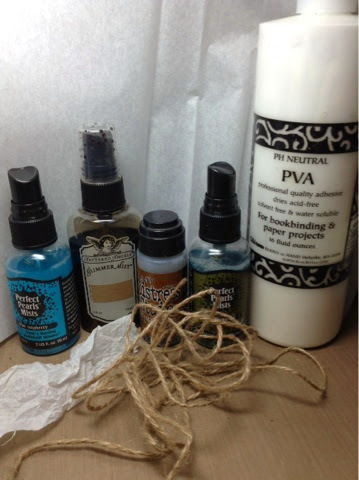 Brought out my Tim Holtz Distress Stains and multiple ink pads. The results are the same no matter what you use, the ink beads up and none to very very little color is absorbed. "Ink-friendly" it is not. I am very disappointed in these tapes. 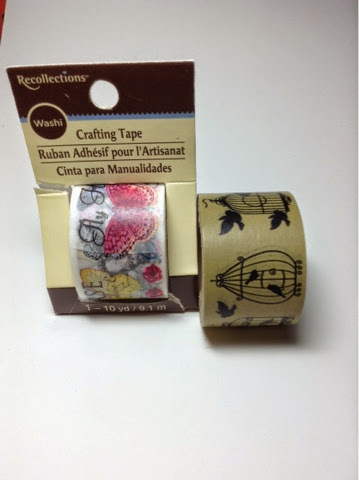 I really liked the designs on these tapes and had such hopes for them, but they let me down. They advertise to be re-positionable and ink-friendly neither of which is true. I kind of feel like I wasted my money. :( Here's to hoping I'll find a use for these the way they are. I'm running so far behind this month it's not even funny. I actually managed to create something earlier in the month but just have not gotten around to actually writing in my blog. So here it is. This months Make it Colourful challenge: Easy - Purple and Turquoise and Hard - Color on something other than your standard white papers. While I love the color purple and it is by far one of my favorites I just couldn't come up with anything that I would have liked in that color scheme quickly. (I'm sure I could have come up with something if I could squeeze an extra hour out of a day and an extra arm out of my body. Yeah, it's been one of those months.) Anyway, I decided to forgo the easy challenge and create for the hard challenge. 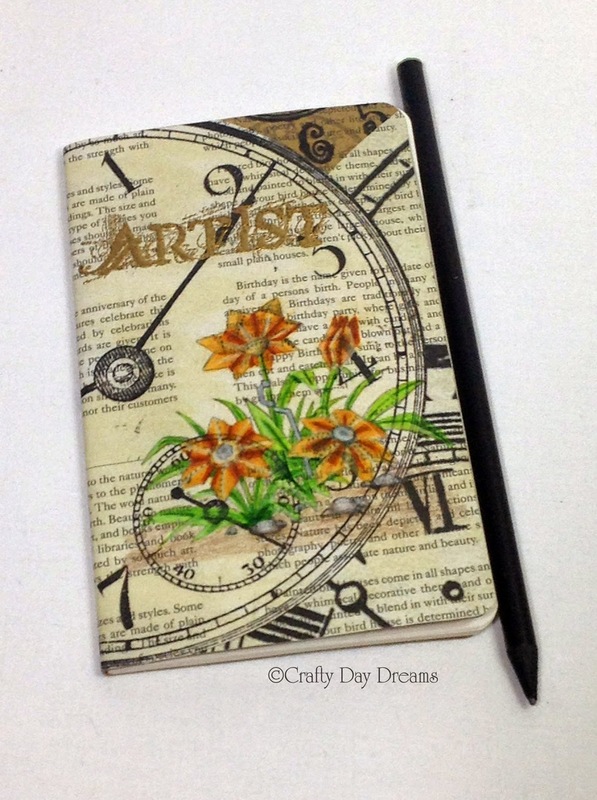 I love steampunk so I went and chose the Metal Flowers digi stamp from Make it Crafty. 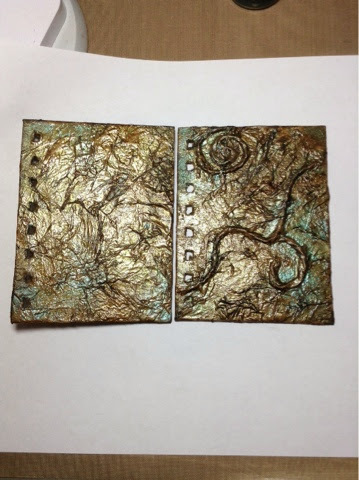 I wanted to use in the creation a mixed media altered Molekine cahier journal. It took me a few print outs to figure out the size and placement of the image. Once I figured that all out I cut a piece of Recollecions Clocks paper and ran it though the printer. With all the text and images on the paper I had to often refer back to one of my scrap print outs to know where to color. It definately was not easy but I am happy with the end result. 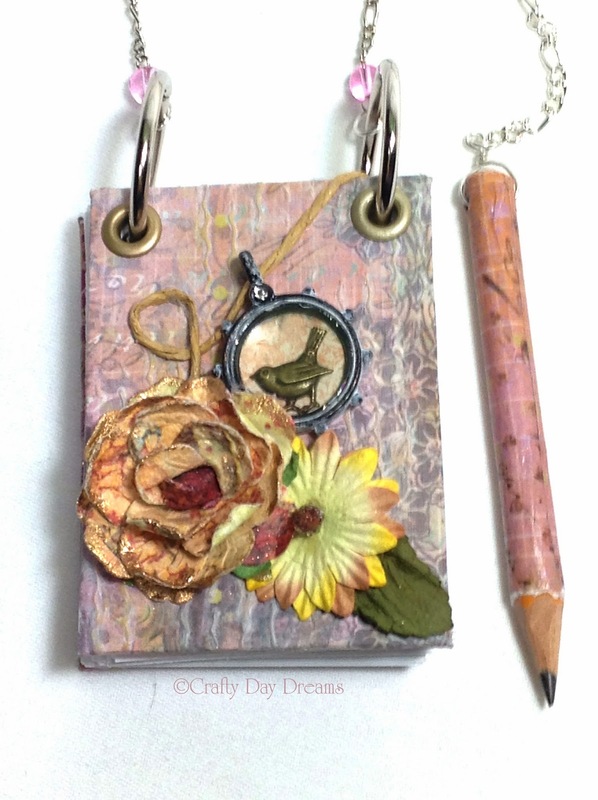 To color the paper I used: Tim Holtz Distress Stain - Antique Linen, Prismacolor Colored Pencils, Twinkling H2Os - Ginger Peach, Golden Fluid Acrylic - Iridescent Silver, Tim Holtz Stampers Anonymous "Artist" Stamp, and Judi Kins Gold Detail Embossing Powder. These have started making an appearance in my stores and I wanted to share just exactly what they are. 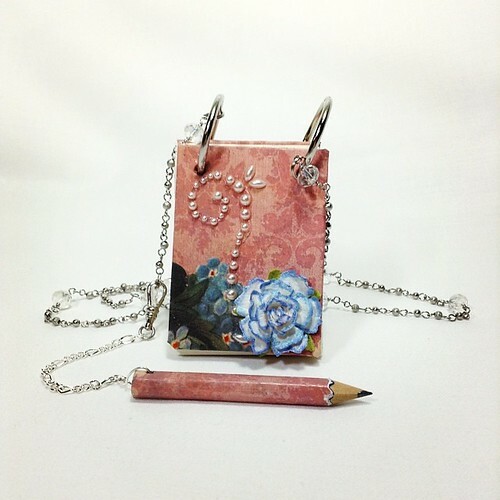 They were designed to be a fun and fashionable way to always have paper with you to take notes, jot down lists or simply pass off a note or number to someone else. They are all handmade and unique. Lets start off by talking about the chains. The chains are long to extra long in length. The lengths of the chains vary but the average is 32"- 36" long. I wanted something that if I'm heading out the door I can just slip on and not have to fuss with clasps and what not. Some chains will still come with clasps but should not have to be used unless you want to. These should easily slip over your head and will come in a wide variety to match the books that come with them. Each end of the chain will have a ring that simply slides on to the binder rings of the book to attach the book to the chain. Moving on to the books. The books measure 2" wide by 2.5" tall. 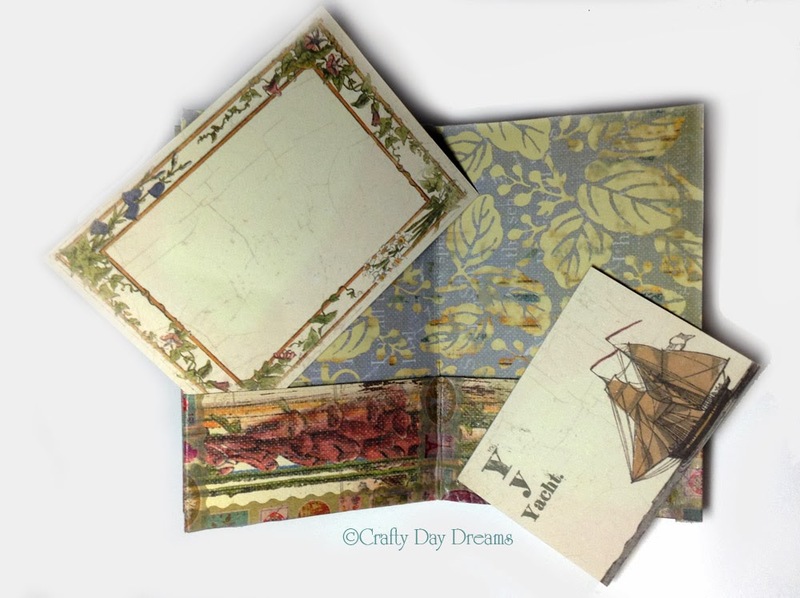 The start off with book board and a selected cover paper. As with all my books a pH neutral PVA book binders glue is used. The covers of the book are punched and fitted with eyelets to help prevent any wear from the rings. The book just grow from there based on my inspirations. There will be some steampunk and tons of floral. 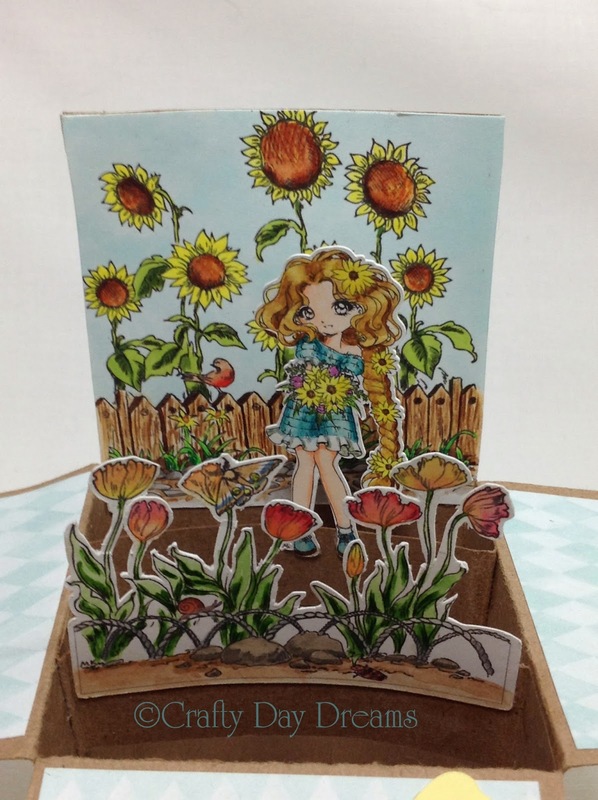 I bought a ton of gorgeous Prima Marketing embellishments and flower so those will definitely be seen on books. You'll just have to keep checking to see the new ones that appear. The paper inside - To start the booklaces come with 50 plain white pages of 28 lb paper, heavier than you standard printer paper. If you don't want the plain, 50 sheets of standard lined paper can be put in instead simply by making a note and letting me know at check out. Other options might develop such as colored paper, which I have a ton of so just ask if you are looking for some, along the way. The over all book itself....It's unique feature is that it is total replaceable, interchangeable and customizable. Simply open the binder rings and a whole other world awaits. The chains are the first to come off, simply slide the rings of the chains off and slide another one on. Next take a cover off or both covers off. 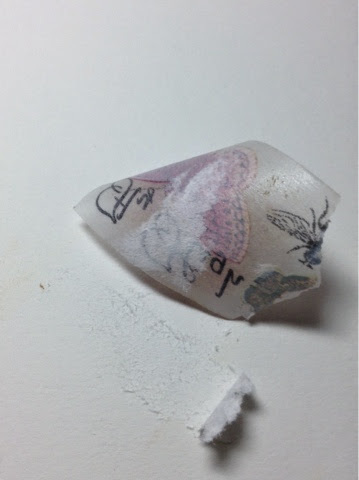 You need to take one off to replace the paper but if you want you can mix and match your covers. One the cover is off switch out the old paper for the new, replace the cover, the chain and close the binder rings. All parts are replaceable and interchangeable so have fun and be sure to check out ArtFire or Etsy for your booklaces. Lots of New This New Year!! 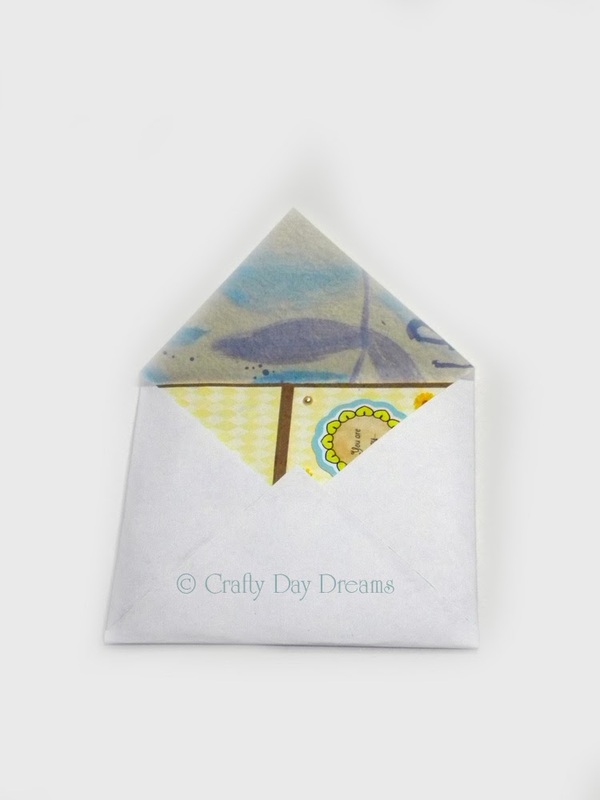 First; I'd like to thank everyone who supported Crafty Day Dreams, your support means so much to me! 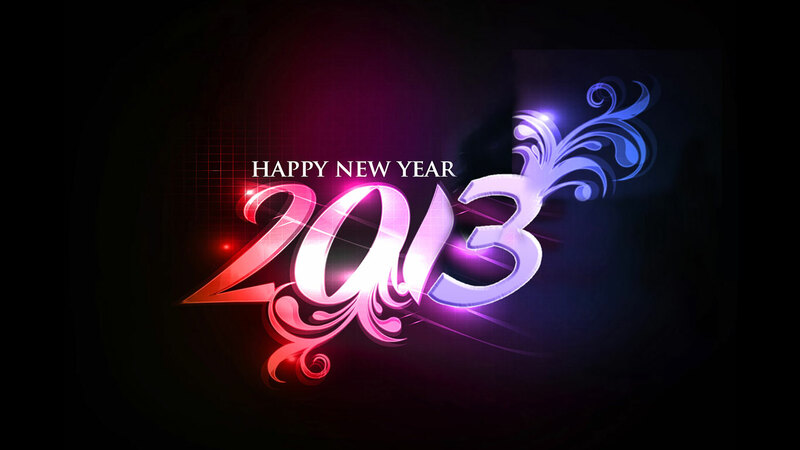 Second; I want to wish everyone a very happy and healthy new year. I decided not to partake in the New Year's resolutions this year for a few reasons, the biggest one being that I normal do not succeed very well at them. I have decided to take on some goals for myself instead. One of these goals is to try to blog more and show maybe more in progress stuff. I'd like to maybe do some videos too. Second goal is to get everything that I have made photographed and listed in my stores. Surprisingly I have a ton of items made that I just have not found the time to photograph and list.